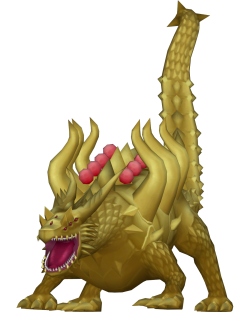 Fanglongmon is a Holy Dragon Digimon whose names and design are derived from the mythological Yellow Dragon of the Center (黃龍 Huáng​ Lóng), known in Japan as "Ōryū" (おうりゅう). It is the "Digimon Sovereign" that is enshrined in the Center, as an emperor Digimon who rules the "world". Supervising the "Four Holy Beasts" who protect the east, west, south, and north of the Digital World, it is an emperor Digimon who is enshrined in the center and rules the "world". Due to the angel Digimon that descended in the distant past, it was sealed in the deepest, darkest place within the earth. The Four Holy Beasts lost their rule because of this, causing a struggle for hegemony, but an equilibrium is maintained at present. This being is good but also evil, and is called the "Taiji" of light and darkness. It has eight eyes and twelve external Digicores, and its gigantic body is covered in scales of the special "Huanglong Ore" that boasts of absolute hardness, so inflicting even a single wound upon it is impossible. Its Special Moves are continuously disassembling everything in the Digital World, throughout eternity, into the two extremes of light and darkness, driving it into non-existence before long (Taikyoku), and generating a gigantic typhoon of an earthflow on the scale of a natural disaster (Oukai). Fanglongmon was added to Korean Digimon Masters on March 19th, 2014. Its first skill and rebalances for the others were implemented on March 26th, 2014. Fanglongmon was added as a Mercenary Digimon to gDMO with the November 24th, 2015 Patch. Cut enemy Digimon off with strong fang. Divide and destroys Digital world with Light & Darkness. Oukai Land attribute 4 seconds cooldown 480 DS consumed 1 skill points per upgrade Learned at Lv. Use Earth & Sand Wind which is equaled with Huge natural disaster and give damages within 8m's radius. The third skill is an area of effect hitting every enemy around Fanglongmon. This page was last modified on 28 February 2019, at 17:11.